Many of us have some idea of where we are supposed to go, but have a less clear sense how to get there. The report has been written and the calls to action outlined. The meetings may have finished and the microphones turned off, but the momentum of truth and reconciliation continues. It has pierced the national fibre, tangling itself up in the yarns, reworking and reweaving them. Embedded in that fibre are institutions of higher education. Behind these ivory walls, a focused conversation continues, in faculty meetings, lecture halls and classrooms, with colleagues, students and ourselves. Variants of the term “Indigenization” punctuate strategic documents and academic plans – those exalted reservoirs of calculated discourse – ushering higher education somewhere, toward something. And, this time, we might even go beyond paltry political platitudes. Many of us have some idea of where we are supposed to go, but have a less clear sense how to get there. Some of us are impatient with the speed of change. Others wade carefully into uncertain waters, ever afraid to offend or betray their ignorance – a near unforgiveable offence in these spaces. And don’t forget that most of us are not Indigenous. We are settlers, with a vague, well-meaning desire to get somewhere that has not completely been defined for us, and without a clear path to get there. We are crossing a plain to a better place, hoping desperately not to mess it up. Again. Situated in teaching and learning centres, faculty developers are well-positioned to be allies in the face of faculty uncertainty. Here and now, teaching and learning centres are being called to go beyond drawing rubrics and flipping lectures. We now have faculty asking us questions like, “How do I incorporate an Indigenous perspective into my computer studies course?” and “How do I bring Indigenous content into my Geology program?” How should we respond? 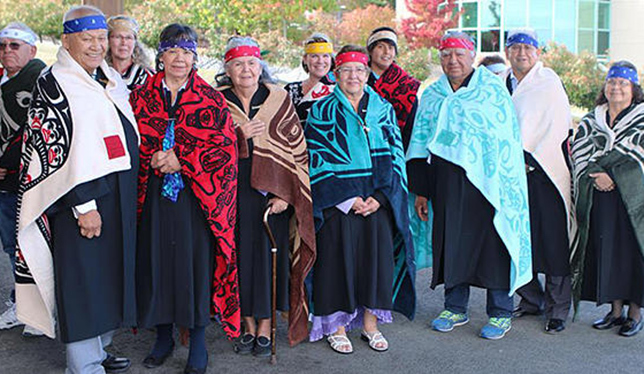 Situated on the traditional territory of the Snuneymuxw people, the teaching and learning centre at Vancouver Island University, where I work as a faculty developer, is moving slowly and gently, with respect and a little uncertainty. But we are eager and well-intentioned. We want to be considered allies, not experts. Here is some of the work we’re doing that may be helpful to others on this journey. We have a lot to learn. Many of us came through systems where the curriculum had massive voids where Indigenous peoples and histories should have been, hollows that we’re only now crawling out of. But, we work at universities and colleges, we are lifelong learners. We really have no excuses for not knowing very much given our access to courses and books, to webinars and MOOCs, to people and stories. A few years ago, our university’s office of Aboriginal education and engagement offered a full-year, cohort-based learning experience called “Learning How to be Together: Indigenous Ways of Knowing in the Academy.” I signed up. Eighteen of us met monthly, on campus and off, to engage with Indigenous and non-Indigenous scholars, to listen to Elders and community members as they told their stories. In hearing them, I began to learn how to listen – really listen. I read articles and wrote reflections, sharing with the group what this all meant to me and to my position at the university. I went into the community, I listened, I made friends and connections. I started to understand the importance of trust and relationships alongside knowledge and understanding. I started to think a little more with my heart. I wasn’t given a tidy set of nine principles to hand out as a chart to faculty knocking on my door. I was given so much more: an opportunity to develop myself more fully as a citizen of higher education. And these opportunities are everywhere. Start with your own institution, your offices of Aboriginal education, or departments of First Nations studies, or your Indigenous gathering places. Go there, introduce yourself. Sign up and see where it takes you. Discourse is powerful. We can talk and we can write about truth and reconciliation, but all the pretty words are empty without relationships and trust to hang them on. We cannot sit isolated in our offices, staring into screens and designing answers. We should be immersed in difficult conversations, listening and speaking, witnessing and being witnessed. We should be connecting with Indigenous and non-Indigenous colleagues and community members, moving forward with words and action. All the while, building and rebuilding trust. Each educational developer at our centre has participated in faculty learning circles in this way. Within these circles, difficult conversations emerge along with relationships and trust. They are powerful spaces in which to learn and connect. But, it takes time. So slow down, make some friends, trust someone, and let them trust you – and don’t mess it up. You don’t become an ally overnight. VIU faculty members participate in an Indigenous learning circle. Photo courtesy of VIU. And then, slowly, while all of this is happening – the learning, the building of relationships, the establishing of trust – maybe, just maybe, a shared path and a shared vision will begin to emerge. Maybe we can begin to see meaningful opportunities to partner with others across campuses and within communities. While immersed in this work, a faculty member asked me how to incorporate an Indigenous perspective into his class. As an ally, not an expert, I was able to broker a meeting between him and the Elder support lead at our office of Aboriginal education and engagement. Because she and I had developed a relationship and some trust, I was able to connect these two individuals. Together, they began down their own shared path, discussing ideas for land-based teaching and learning opportunities that aligned with Indigenous ways of knowing on traditional Snuneymuxw territory, and with the content and learning outcomes of his course. Slow down. Take a breath. Check that overwhelming desire to put together a faculty handout or webpage. As leaders in faculty development, we need to model how to hold two or more epistemologies in tandem. It’s a feat. Our ways of knowing, being and doing – those lists, those case studies, those pretty words – they work, but maybe not right here and now. We have the privilege of existing in this space in higher education during a monumental shift in knowing, being and doing. And we in turn must also shift, while balancing the tensions that come with relearning, re-trusting, re-friending. This is our challenge. And as we move forward on this path, we will begin to see opportunities to meaningfully integrate our emerging understandings with our existing ways of doing. The yarns will continue to tangle, to be reworked and rewoven. We will be richer for it, and so will our institutions. Something has begun and we are part of it. So let’s go slowly and gently, with respect and a little uncertainty, towards becoming an ally, not an expert. Kathleen Bortolin is a curriculum, teaching and learning specialist in the Centre for Innovation and Excellence in Learning at Vancouver Island University.